Contemporary beachfront escape with stunning Gulf views, 2 decks & a fenced yard! Walls of windows showcase the Gulf view, updated furnishings ensure your comfort, and the open floor plan makes it easy to enjoy meals together with your family and friends. 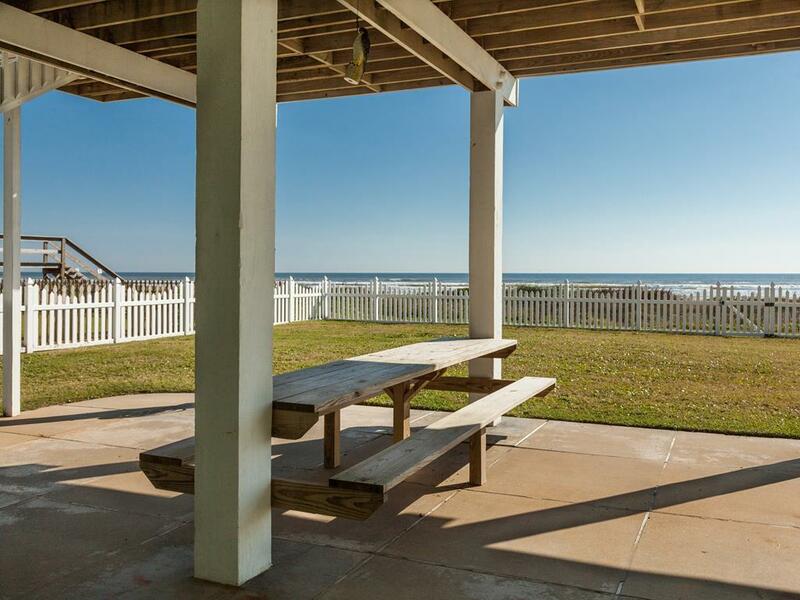 This gorgeous beachfront vacation rental is the perfect place to kick back and relax during your next Galveston Island vacation. Gather your favorite people and get ready to soak in the sun, swim in the waves, and rejuvenate at the beach - the sand is only a few steps away! Great house. New appliances and utensils. Very comfortable. The open concept was perfect for our family! The table for 10 was my favorite— that we could ALL sit down together for our meals!! We loved staying at "The Yappy Turtle." The owners have all the cabinets labeled, which was awesome! No spending a lot of time searching for items. When we come back to Galveston we will definitely try to stay here again. Loved the short distance to the beach, too! My family’s stay at the Yappy Turtle was absolutely amazing. The weather didn’t quite cooperate, so thank goodness we had a fabulous beach home to spend our time in on those days. Everything was neat and organized to the max. Everything was labeled for my convenience, and the property owners of course! Great beach home and we will visit it again. We have been coming to Galveston for over 10 years and this was our favorite house so far. The only issue we had that wasn’t handled as quickly as we would have liked was the televisions. We had issues getting all TV’s working correctly. The weather turned out very cool or we wouldn’t have cared. This house is awesome and the property had everything labeled and this was so helpful. The management co was very helpful on all of our other issues and were very professional and we would highly recommend this property and SandnSea!!! Beautiful views of the Gulf and easy access to the beach. Fresh water for rinsing off and Picnic table downstairs is really nice. Charcoal grill is fairly small though. Home is very comfortable and all appliances and furnishings work well. Beds are very comfortable too. We would stay at this home again! This home is lovely. The owners thought of everything from coffee and tea to labeling things in the kitchen for easy access. Very clean and well kept with. Perfect close access to the beach, especially if you like to get sand between your toes. The fenced off deck is a great addition to the property, especially when you've got a feisty 2 year old who can reach all the doorknobs. We found this beautiful house updated beach front like one step outside. Like private beach and no driving on beach. Private but was close to moody garden, strant, all restaurant like 10 min also close to water park so it's perfect location! I have stay many house but this one is perfect distance to everywhere. Love this house, yearly tradition. It's best location quiet private beach front but still close to strand. Few miles to main location. Love watching stars at night. Feels private but yet it's happening area. The home very comfortable and right on beach. Sunrise views fantastic. This is one of my fav beachfront property in all rentals. It's beautiful, modern, upscale, and has the beach feeling. It's super safe for kids fence in front of beach. The best part is the private beach. The house is well stocked from pots,pans to shampoo and conditioner. The most modern, cleanest house I have rented. Love the private beachfront! Wifi password is on router upstairs bedroom. Also love it has 2 master room. One upstairs and one downstairs. So it can accompany two families. Or privacy. Love tile and windows!! Beautiful beach house on the beach. Well equipped with kitchen appliances - pots and pans, dishes, coffee makers and blender. Be sure to bring paper towel, toilet paper and ziplock bags. I loved this house. It was very well stocked, right in front of the beach, and super comfortable. Great location and well stocked house! The upstairs bunk room tends to be a bit too warm without a fan. I would recommend taking one to use at night up there. Upscale modern beach house. We walked 2 step and beach is there. It is almost like having your own private beach, It was quiet and peace full and very clean house. It has everything. The bedrooms are big. Open modern concept. and private fence. Stayed at many beach front property, hands off this has it all. OWN PRIVATE SECLUDED CLEAN BEACH. All yours! We enjoyed the effort the owner made to make us feel at home. the kitchen was labeled and contained many items beyond my expectations. I will bring a few blankets next time. Everyone was impressed with the beauty of this house and location. We love this property. It was the perfect spot on the beach. Loved Yappy Turtle!!! The kitchen is well stocked and organized. The decor is light and fresh. Yappy Turtle is so close to the beach. It is a great house!!! Great property for families. Everything was provided and loved that the table sat 10 people. This house is gorgeous - loved everything about it. It is super clean and decorated very nicely. Beds are comfortable and we loved the rocking chairs on the deck - woke up every morning having coffee on the deck and watched the ocean waves. We will definitely stay here again next year. We want to thank the owners for letting us stay in their lovely beach home. We had a blast at the Yappy Turtle. The house is fully stocked with anything and everything you could think of. Super clean and comfortable. We will be renting this house again!! Clean, right on the beach, equipped! The Yappy Turtle is very nice! It is a study home, AC works great, kitchen is stocked well...loved the fenced yard, too. Would definitely rent it again. It was a wonderful vacation! Coming back next year...probably to a different property but definitely Sand n Sea! Thanks to you all!!!! If you plan on cooking for a crowd bring a large skillet or griddle. Otherwise kitchen is well equipped. This is the most amazing property in Galveston, a lovely white picket fence house with amazing views. Located in the cleanest beach with no crowds at all and no vehicle access. Beautiful home and very well appointed. Gorgeous master bedroom. Great location. Overall just a lovely house. Great house and great condition.